Lamebookfail. Not funny. In any way. L2INTERNET FUNNY. BLACKS, firstly, your website is chickswithdicks.com everything you say is invalid forever. So is this here because of Margaret’s lameness, Paul’s dong, or both? Courtney is the winner this round. this has piqued my curiosity as to how sick a dong can actually get. Sick as a dong? Baha, love it. At least Margaret’s not whining about missing out on a Twilight movie. I’m feeling very “silver lining” with this comment. Sick as a dong, puking yoghurt. lmfao @sick as a dong. 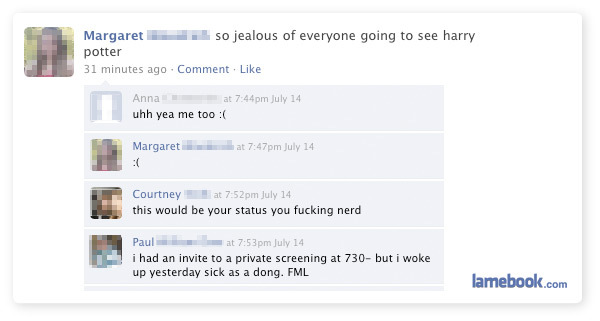 Pretty sure this is the only lamebook post that made me laugh that hard. Laaame. Why is this filed under TypOHs!, anyway?